I used to collect pictures of people who had found their gimmick. My collection started with a guy called Grimes Poznikov, the automatic human jukebox. He sat inside a phone-booth shaped cloth cage with his repertoire of songs painted on the sides and a slot to insert money. You would put in the money, say what song you wanted and he would play it on the trumpet. Badly. He set up shop near Ghirardeli Square and was frequently arrested at the behest of shop owners in the area. A week later he would be back. He was a man who had found his gimmick. Usually the finders of gimmicks are trapped in them and never move on to something else. My collection included a picture of Tiny Tim, the man who sang with a high pitched flutter, played the ukulele and got married on the Tonight Show. One picture had Lily Tomlin and Julia Child together. They had met at Macy's, I think. Perhaps they both loved their gimmicks and did not want to move on. One was a photo of a guy named Demming who did corporate motivation. He had this box of red and white beads and this incomprehensible illustration of why everything is management's fault. I could not help associating his with Hesse's The Glass Bead Game and wondered if he had read it. This is a fascinating game and applies in any context. Try it. I want to give Bob Dylan credit--no matter how tempting it might have been to stay in his rut of success, he always transcended his gimmick and looked for new music to make. Grimes Poznikov, the street performer known as "The Automatic Human Jukebox" who became one of the city's most popular tourist attractions before he was sidelined by mental illness, has died at age 59. In the 1970s and early 1980s, Poznikov sat in a painted refrigerator box and played songs for cash at San Francisco's Fisherman's Wharf. His act was so popular he was booked on national television shows and featured in news articles and travel guides. But by the late 1980s, schizophrenia had made him so erratic he could no longer perform and forced him onto the streets. He died from alcohol poisoning and was discovered dead Thursday on a sidewalk near a San Francisco freeway, according to his sister, Jenny Predpelski of Overland Park, Kan.
"He was brilliant, but always missing a few cards in his deck," Predpelski said. "From the time he could talk, he could play any instrument from piano to trumpet and drums, and he was a very bright student." Born in Neodesha, Kan., Poznikov studied psychology at Cornell College in Iowa and taught elementary school in Chicago before he began bringing his music act to anti-war protests around the country. Then the self-styled hippie became a street performer in San Francisco, where tourists could request songs that he'd perform on trumpet, kazoo or one of several other instruments he kept in the painted box. Poznikov is survived by his sister and two brothers. In the days before schizophrenia stole his wits, Grimes Poznikov played music on "The Mike Douglas Show" and was lauded by journalist Charles Kuralt as one of the most popular entertainment attractions in San Francisco. It was the 1970s and early 1980s -- and Mr. Poznikov, "The Automatic Human Jukebox," sat at Fisherman's Wharf in a refrigerator box playing songs for cash. He was a very good musician by all accounts, a skill he always attributed to growing up in a house where everyone played an instrument and his mother was a locally famous singer. But that was in the old days. By the late 1980s, Mr. Poznikov's mental illness made him so erratic he could no longer perform, and he began sleeping in the streets. And that's how he died, from alcohol poisoning, on Thursday. A passer-by discovered him lying on a sidewalk near the corner of Caesar Chavez Street and Highway 101. He was 59. "He was brilliant, but always missing a few cards in his deck," said his sister, Jenny Predpelski of Overland Park, Kan. "From the time he could talk, he could play any instrument from piano to trumpet and drums, and he was a very bright student. "But somewhere along the way, he decided he wanted to be a hippie. His music career was good with the jukebox act, but after he started to go downhill about 15 years ago, we just sort of lost him." Mr. Poznikov was born to Bernie and Albert Poznik and raised in Neodesha, Kan. His father was a lawyer and his mother ran an art studio and acted in local theaters, gaining area renown for acting and singing, particularly as the lead in "Mame," said Predpelski. "It was a great life, but Grimes just didn't want to be in a small town," she said. "Once he left here, he never came back." One of Mr. Poznikov's first unconventional acts came when he was drafted after high school and showed up for his draft board hearing stoned on acid, relatives recalled. He was rejected for service, and went on to earn a bachelor's degree at Cornell College in Iowa in 1969, majoring in psychology. Mr. Poznikov taught elementary school in Chicago for three years, but soon became restless as he got more attracted to the counterculture, his sister recalled. Mr. Poznikov already had been arrested at the 1968 Democratic National Convention in Chicago with other anti-war protesters while blowing "America the Beautiful" on the trumpet, and while he was teaching he became more involved in the peace movement. In 1972, he set up a trailer at the Republican National Convention in Miami, calling it the "American Lobotomy Machine." He and other peace demonstrators sat in it for hours, pretending to be brainwashed into being "good Americans." That same year, he abandoned the teaching career, tacked the "ov" of his Russian ancestors onto the end of his name, and moved out to San Francisco to try his hand at professional music. Being a self-styled hippie, the street scene drew him first. 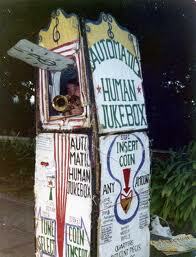 "He'd got the idea for the Automatic Human Jukebox act in Amsterdam, watching street performers," said his sister. "So he decided to try that out West." It was a simple, but brilliantly successful act. Mr. Poznikov would sit at Fisherman's Wharf near the cable car turnaround in a painted refrigerator box. On one side of the box were dozens of little tabs cut into the cardboard, each with a song title written on it. On the other side of the box was a slot for dropping in money, and on the front of the box was a lid operated by a pulley from the inside. Tourists would push in a song tab, drop in money, and the lid flipped open to reveal Mr. Poznikov in a fedora hat and tie. He'd reel off the song on trumpet, kazoo or any of a half-dozen other instruments he kept in the box. The quality of the song depended on how much cash was dropped in the slot. A reporter selected "I Left My Heart in San Francisco" one hot summer day in 1976, slid in a dime, and got one quick kazoo blast. The reporter then tossed in $2, and when the performance lid flipped open Mr. Poznikov blew a soulful, pitch-perfect version of the same song on trumpet, fetching cheers from the crowd of 40 people gathered around. The act was so popular he was booked on national TV shows and featured in news articles and travel guides all over the country. At least two Web sites are devoted to the memory of his act. "He is a true musical genius, and like all creative giants, he always lived a few notes ahead of the masses," Bill Self wrote on one of the sites, saying he was a childhood friend of Mr. Poznikov's in Kansas and kept in occasional touch through the years. In 1987, after being ticketed by the police for playing his trumpet 13 decibels above the legal sound limit, Mr. Poznikov quit his act, moved out of his rented apartment and began sleeping in the streets. He stayed with friends from time to time -- particularly his off-and-on girlfriend, Susan "Harmony" Tanner -- but the freedom of the outdoors always pulled him back to the sidewalk, he told a reporter last December. "I never got a chance to do the stuff I wanted to for him because he made himself hard to find," said Niels Tangherlini, a San Francisco paramedic captain who counsels homeless people in the street. "It amazes me how people who are so sick manage to elude us. It was very sad for him to go that way." Mr. Poznikov is survived by his sister; Tanner; and two brothers, Greg Poznik of Madison, Wis., and Sam Silver of Aurora, Colo. Chronicle reporter Ilene Lelchuk contributed to this report.